We often have a strange assemblage of items on our kitchen counter. But this one was the most intriguing lately. Time to make sausage and stuff it in a pork tenderloin. Chorizo. Say the word, and each person conjures a different taste. Chorizo can be fresh or cured. As far as I can tell, Spanish chorizo has plenty of paprika. Portuguese chorizo is heavier on the wine. 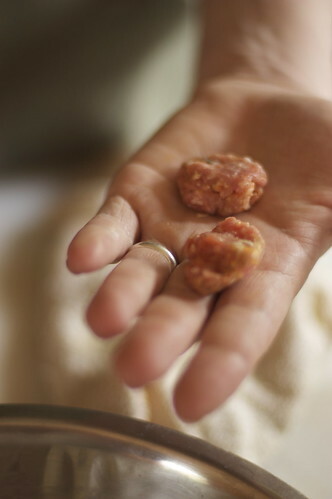 Mexican chorizo is made from ground pork, instead of chopped. In Argentina, chorizo means any kind of sausage. Which kind is this one? Oh, none of them, although it’s probably closest to Spanish chorizo. It’s ours, in the moment. Danny doesn’t love food to be spiced so hot it puckers his tongue. (I like a bit more heat.) So this is milder than most chorizos, which makes it good for stuffing tenderloin. He wanted all the flavors to blend. We enjoyed it, thoroughly. Oh, chorizo. You inspire so much great food. That just means another bite of sausage for you, which isn’t a bad thing, really. Assembling. Mix all the ingredients together. Tiny tasting. Make a tiny taster of the sausage. Bring a sauté pan to high heat. Pour in a splash of oil. Put the tiny sausage patty in the hot oil. Cook until the internal temperature reads 160°. Eat, to check the seasonings. Adjust accordingly. Cooking. 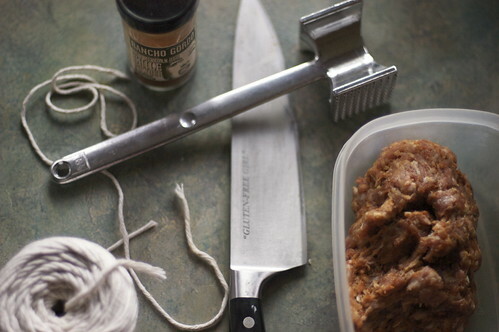 If you are using this chorizo to stuff a pork tenderloin, leave it raw. If you want it for breakfast, cook it up in the same fashion as the taster. I am not much of a pork fan but these look very yummy! I read your last post about the chicken pox! Oh Shauna, I hear you! We have had the same thing going on here for the last 5 weeks! All 4 kiddos got them, as did Tom. Luckily we have had Grandma in town! So we’ve still been eating well and I have been able to work on my next cookbook (a little)! I absolutely LOVE chorizo. Great job – bookmarking this. Great idea on the testing samples! I do that with cookies sometimes if I’m not sure about an adaptation or conversion. I just bake one or two and see how they bake up … then make some changes in ingredients or oven temp if necessary. Lots of great links here–thanks! Chorizo-stuffed tenderloin sounds like an excellent idea. I should thank you even before I make any chorizo. My husband is 1/2 Spanish, so he can’t wait for me try my hand at this! I’d go anywhere for a good Chorizo. I love chorizos and chickpeas. I have signed up with your flickr group – am looking forward to it! Also, you totally beat me to the punch on making Molly’s Chocolate Banana Bread with Crystalized Ginger gluten-free! I am just not as on the ball as you are, but i swear to you that I was planning on it in the next few weeks! Can’t wait to try your version. I absolutely love Spanish chorizo sausages, but I get frustrated with the ‘pre-made’ ones as they’re so full of gunk, and so expensive! Thanks so much for this recipe – I’ll be trying it very soon! My favourite recipe with chorizo sausage is a corn and potato chowder with chorizo and baby spinach, made in the crockpot – yum! Looks really good – and the recipe sounds delish, even if I’m not a fan of pork. My stepfather is, and this recipe’s quite similar to a sausage his father, a former butcher (my Pop-Pop) used to make and sell when he was young. Hi Shauna, two comments in one day. I am a Spanish girl, and I was very surprised when reading your book you talked about Spanish paprika. Hey, just a second… Spanish what? Then you explained about drying and smoking peppers and… wow… I discovered that what you call “Spanish paprika” is known here as “pimentón” (we think paprika is an exotic spice), and it can be sweet or spicy. Spanish “chorizos” always have a lot of “pimentón” inside, if not, it is not a “chorizo”. If you want chorizo recipes, you should look for some Spanish ones, you will love them. Mmm… it sounds wonderful! Sadly, along with gluten, I also avoid pork. And shellfish. They aren't allergy-related, but I avoid them anyway. If I substituted ground turkey, would it still be considered chorizo? Maybe ground buffalo? That would get expensive, though! I have cooked these with turkey and chicken for my son (who is gluten free) as well as my dad who has high blood presser. It still taste wonderful but not quite the same . They both loved it . I cooked and used my Chorizo in a corn chowder as well as in an awesome brunswick stew.